I've recently knew that Brussels is changing its flag. 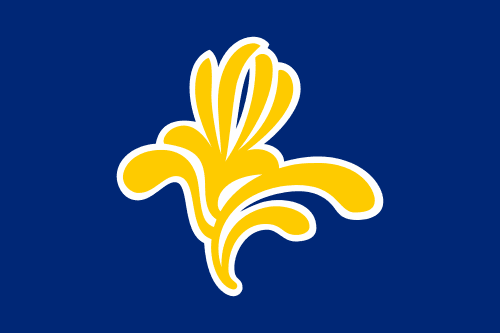 The change, however, is subtle: the flag is still a yellow iris in blue, but the design of the flag is different. The rationale for the flag change is, actually, kind simple: the previous flag contained the old logo, the current contains the new. 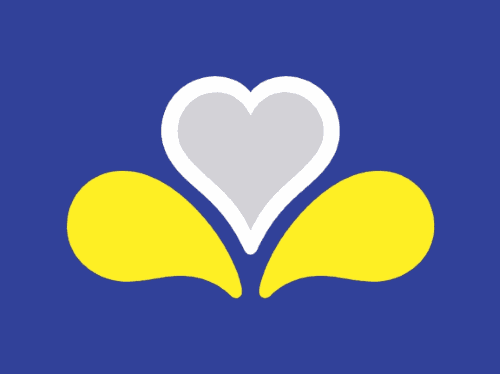 The current logo has a heart, representing the openness and hospitality of its people, and the fact that Brussels is in the heart of Belgium and Europe (hosting many European Union's bodies). The yellow iris is a symbol of Senne's valley due to a legend telling that the Duke of Brabant once won a battle because he knew that yellow irises only grow in shallow waters. It's fair to keep them on a flag for Brussels-Capital region. I don't really think that the white fimbriation is needed (it appears in the four flags above), but it increases the distinctiveness of the flags. 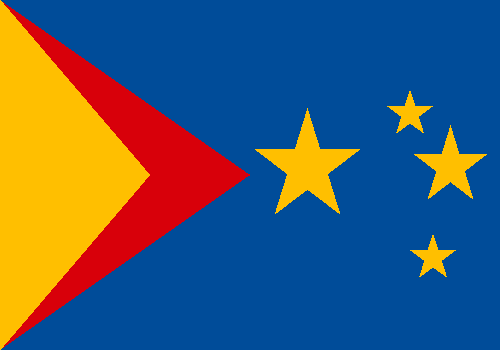 I kept the blue background as it remembers the EU flag, linked to the region. You can read more about Brussel's rebranding here. 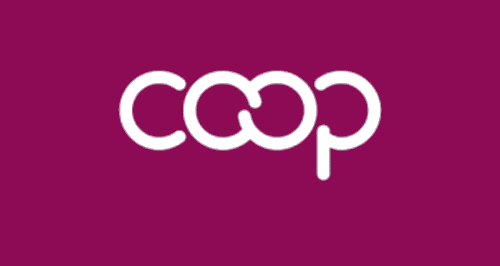 The International Cooperative Alliance (ICA) is the oldest international cooperative federation. 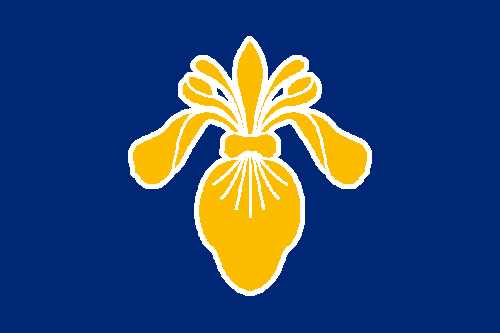 The idea about making a flag for it came from an article I was writing about the flag of Cusco (Peru): the former ICA flag was identical to the Peruvian city's, and are probably related. 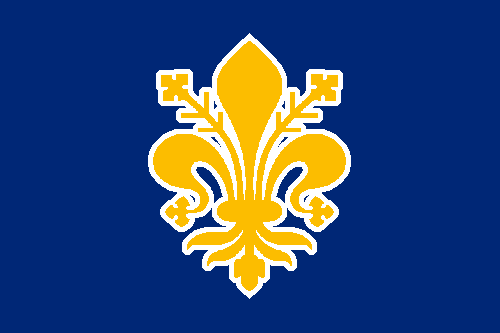 Since then, the flag was replaced once again, for a more logo-like flag. Notice the image formed by the two letters O. My proposal uses a different cooperative symbol: the twin pine trees. I put it on a green background. The pine tree is an ancient symbol of life and endurance, while the circle represents eternity. The fact that there are two pine trees represent union and cooperation. Green is a color of life (because of chlorophyll), while the golden yellow represents the sun (specially because it's on a circle), the giver of the life and the light. 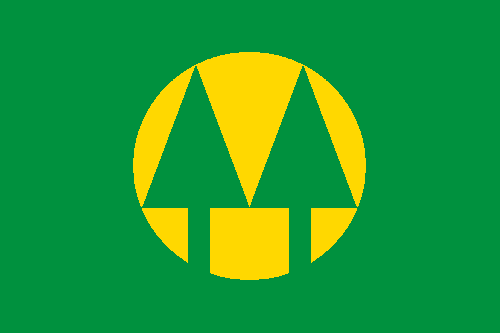 For the final design, I chose a variant of the logo where the pine trees are formed by the negative area of the yellow part, but whatever twin pine trees would work. 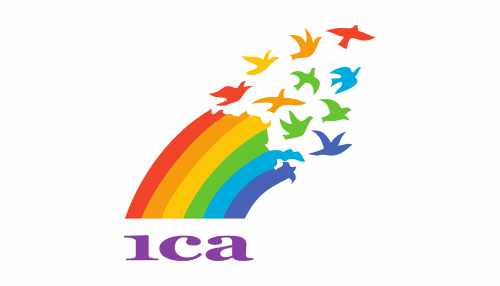 I am happy with the flag, and I think it could embrace not only ICA but cooperativism as a whole. Have you read my post about Cusco? No? You have another chance. 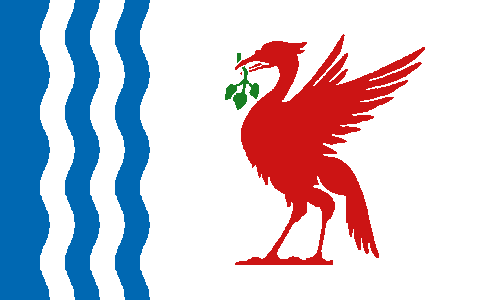 More than two years ago, I proposed a flag for Liverpool. 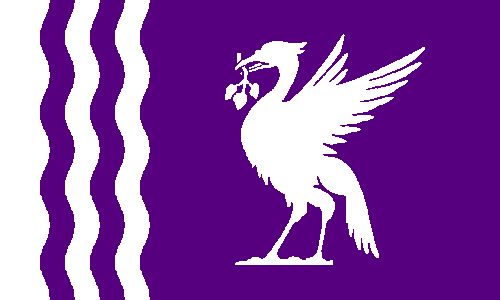 After I found a campaign called "Flag for Liverpool", I decided to have a second look at it. The purple color is currently used by the city council. It's a neutral color since it's a mix of the colors of the two main football (soccer) teams: red for Liverpool FC and blue for Everton FC. The white stripe in the hoist represents the River Mersey, an import point of Liverpudlian landscape. The bird is a liver bird, a key symbol of the city, often represented as a cormorant. My first new design was simply substituting the vertical stripe to wavy stripes, and using a neutral liver bird, since the previous was taken from Liverpool FC logo. My second new proposal substituted the purple to red and blue, firstly in a arrangement that's also reminiscent of Union Jack. 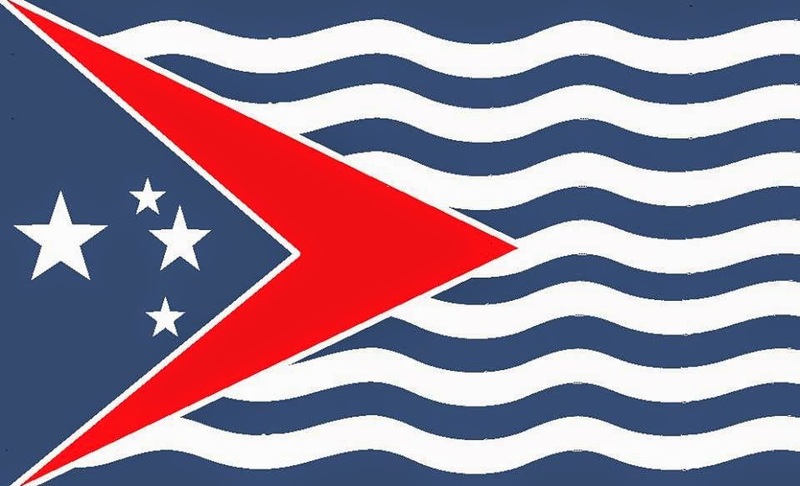 I don't know how much a flag with both red and blue can be neutral, but I think the last two designs are very charming. Don't forget to check "Flag for Liverpool" page! Trindade and Martim Vaz is a Brazilian archipelago inhabitated by military only, administratively belonging to the capital of Espírito Santo, Vitória. The red triangle refers to name of the main island (Trindade = Trinity), and the background represents the sea. The coat of arms, (don't know if intentionally) very similar to other coats of arms of Espírito Santo, represents: in fist quarter, a representation of the flag of Principality of Trindade, a failed attempt to establish a micronation in the Trindade island during the 1890s; in second quarter, the position of Martim Vaz and neighbor islands (known as "north island" and "south island"); in bottom. a view of Trindade. 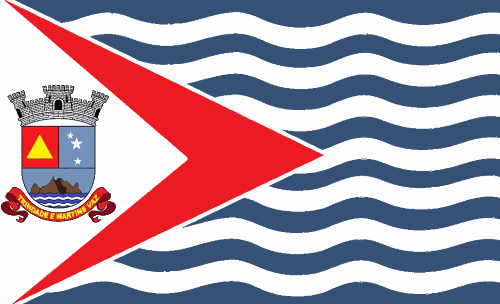 The triangles on hoist now emulates the coloring of Principality of Trinidad's flag. On a blue background, standing for the sea, a map of the islands. I desire all readers that an amazing 2015!